Goodbye, Blog Hiatus. Goodbye, Giant Nest. I just tried to switch this ancient, weak Blogger blog to the Mega Extreme New Beta Blogger with Added Calcium for Stong Bones and Teeth. I was unsuccessful. Hmmm. So this is what it feels like to fail. What a strange... sensation. As you may know, I've never failed anything before. Don't quite know what to do with myself now. How does one live? Or as Edward Kennedy once asked, "How can people have hope when we tell them that they have no recourse if they run afoul of the New Blogger?" And more importantly, how can I come down from this ghastly sugar high? 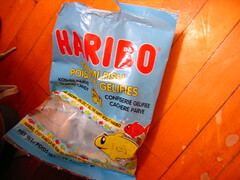 Just finished a package of gummi fish and I can't feel my feet. I believe this was Blogger's plan from the word go, to release MegaBeta precisely when they knew bloggers would be zooming upward on a seasonal sugar trajectory. I have also been flummoxed by BloggerBeta and too buzzed to respond. Go figure. I suggest drinking yourself into merciful oblivion. There's nothing worse than a gummi hangover. Have patience. The Lord Our Blogger tests our faith at times, but Blogger always rewards those who are steadfast. I suggest painting excited works of art that later make good conversation pieces. It's what I do. In other news, a Google search for your name returned 32,000 results. Does this not brighten your day considerably? Your gummis were made out of hashish. It is not a good high to come off of. I went Ice Fishing with gummy worms. I caught frozen fish and fried them. It is not as good as Long John Silver's and that makes me mad. They advertise LJS on the square eyed monster here, but you cannot buy it here. WHom should I kill. I don't like the look of the new Blogger EULA, which appears to give Google the right to show ads on your blog site. Oh, you poor Old Blogger peasant. You cannot know how beautiful it is here in New Blogger. Ahh, gummies. I shall try some again tomorrow. We see. We see.